If you are thinking about changing your diet to lose weight, you might be curious which foods you should be eating. Many people like fruit but are not sure if it fits into a weight-loss diet because of its sugar content. However, watermelon is an ideal diet food specifically recommended by the American Council on Exercise for people who want to lose weight. Watermelon is an ideal food to support your weight loss goals because it is so low in calories: 1 cup of watermelon contains fewer than 50 calories. Exercise is important, but weight loss remains a matter of simple math and is a product of consuming fewer calories than you burn. In order to eat fewer calories and lose weight, Centers for Disease Control and Prevention suggest substituting low-calorie fruits such as watermelon for high-calorie options. Because watermelon is so sweet, you may find it a convenient substitute for high-calorie treats such as ice cream, fruit pies, cookies and candy. Many dieters avoid fruit because of its sugar content. The Joslin Diabetes Center explains why this is a valid concern. Carbohydrates, especially certain kinds of sugar, can raise your blood sugar levels. When this happens, your body releases insulin to stabilize your blood sugar levels, and insulin release can encourage fat storage. The glycemic index shows the potential effect certain carbohydrates have on your blood sugar levels. Foods with an index over 70 are thought to raise your blood glucose and insulin levels significantly. Watermelon is ranked at 72, plus or minus 13 points, making it a high glycemic food. Jonny Bowden, a clinical nutrition specialist and author of the book "The 150 Healthiest Foods on Earth," contends that watermelon's glycemic index ranking of 72 wrongly suggests that the fruit is not a good diet food. He explains that a food's glycemic load is a much more significant factor concerning a carbohydrate's effect on your blood sugar levels and weight loss goals. The glycemic load measurement takes into account the glycemic index of a food and how many carbohydrates the food contains in a serving. Watermelon has a glycemic load of 4, which is very low. Bowden says you should not worry about watermelon raising your insulin levels and causing fat storage. 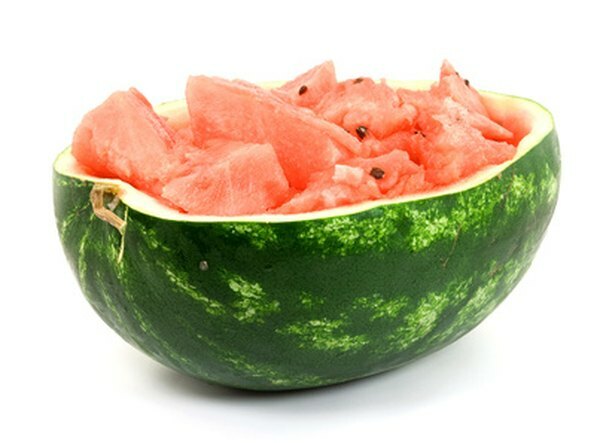 True to its name, watermelon has large amounts of water, larger than nearly every fruit you can eat. This is another reason that it is an ideal weight-loss food. Foods with water can help curb your appetite and keep your feeling full for longer. Penn State University researchers note that water consumed from solid food stays in your stomach significantly longer than if you drink water as a beverage, drawing a connection between "eating" water and losing weight, and consider many fruits to be ideal choices for dieters. American Council on Exercise: Do Negative-Calorie Foods Really Exist?